We’d love your help. 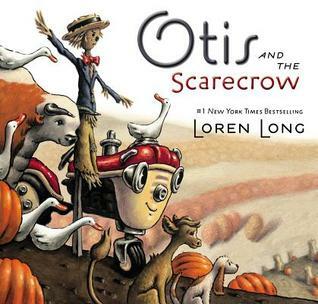 Let us know what’s wrong with this preview of Otis and the Scarecrow by Loren Long. On the farm where Otis the tractor lives, the farmer has introduced someone new—a scarecrow to shoo away the pesky crows. But when Otis and the animals greet the scarecrow with friendly smiles, the scarecrow’s frown never leaves his face. So everyone leaves him alone. Then one day, when a cold autumn rain sets in, Otis and the animals snuggle close and play Otis’s favorite game: the quiet game. Otis knows the puppy and ducks can’t sit still for long, and soon the farm friends begin to giggle and squirm, feeling warmed by one another’s friendship . . . but on this day, Otis can't seem to take his eyes off the lonely figure in the cornfield. To ask other readers questions about Otis and the Scarecrow, please sign up. I love this sweet book. Otis the tractor was friends with all of the animals on the farm-dogs, pigs, horses, bulls, ducks, geese, etc. In this warm and friendly story, the farmer brings in a scarecrow to sit in the corn field and scare away the crows. He wears tattered clothes and has a permanent scowl sewn on his face. Otis and the animals try to befriend him but the scarecrow just looks off into the field, continues frowning, and doesn't speak to them. As the summer turns to fall, Otis works h I love this sweet book. Otis the tractor was friends with all of the animals on the farm-dogs, pigs, horses, bulls, ducks, geese, etc. In this warm and friendly story, the farmer brings in a scarecrow to sit in the corn field and scare away the crows. He wears tattered clothes and has a permanent scowl sewn on his face. Otis and the animals try to befriend him but the scarecrow just looks off into the field, continues frowning, and doesn't speak to them. As the summer turns to fall, Otis works hard but loves gathering with his animal friends for fun and games. He can't help but watch the forlorn scarecrow out in the empty field all alone. Part of a series about a sentient tractor named Otis. Read this one for the "crossing the cornfield" part of my road narrative project. The thing is, Otis is a tractor and he's sentient, so I went through the entire book not sure if the Scarecrow was just stoic or not sentient at all. But maybe that's part of the mystery of the story. They did introduce the "quiet game" though, hah. I love the Otis book series. This book though lack the feelings I experienced from other books. Two stars for the story: yes, how noble to befriend an unsmiling, 'lonely' scarecrow, but can we call it friendship when it's only one sided? Maybe the scarecrow LIkes to be alone - this story makes it seem like being alone is a bad thing. Four stars for the interpretive illustrations: the faces, the expressions, the way the objects on the edge of each page imply the fields go on and on and on! Otis is a tractor who loves the fields and is friends with the animals in the farm. One day a scarecrow arrives and he doesn't seem to be interested in joining the others in the fun. At the end, Otis reaches out and the animals follow, but the scarecrow stays there, with the same serious face, and does nothing. Duh, said the little one, it is not alive! The text is a bit long, not for small kids, but with lots of vocabulary opportunities. The story itself I found a bit bland and I didn't like Oti Otis is a tractor who loves the fields and is friends with the animals in the farm. One day a scarecrow arrives and he doesn't seem to be interested in joining the others in the fun. At the end, Otis reaches out and the animals follow, but the scarecrow stays there, with the same serious face, and does nothing. Duh, said the little one, it is not alive! The text is a bit long, not for small kids, but with lots of vocabulary opportunities. The story itself I found a bit bland and I didn't like Otis that much. It's not like he's a bad tractor, not at all, we just didn't click. Fantasy. 2014. Otis the tractor and his animal friends on the farm notice the farmer has brought a scarecrow onto the land. Otis and his friends do their best to befriend the scarecrow but nothing seems to work. I choose to give this book two starts because Otis and his friends do try and reach out to the scarecrow, who doesn't look so happy, but in the end their efforts do nothing. I wish that the ending would teach kids that reaching out will make a difference, because it truly does. Otis and his friends don't know what to make of the new scarecrow who stands in the pumpkin patch through all the seasons, silent, still and with a grimace on his face while they go about their business on the farm. With a sly twist of humor and an act of kindness one could image a friendship beginning, but the ending falls a bit flat and young audiences will most likely not see a strong message of reaching out to include other from this tale. I like Loren Long’s Otis series because of it feel so American to me. Does that make sense? It has tradition and values. This one, though, fell flat to me. At least, the way they handled the scarecrow’s expression at the end was interesting. The illustrations remain pleasant to look at! The latest entry in the Otis the tractor series pushes the theme of inclusion and friendship a little too far with Otis trying to include the totally non-responsive scarecrow in his circle of farm friends. It feels a bit too didactic. Good message, but way too long for even a preschool storytime. Is there a sweeter tractor than Otis? Wonderful illustrations, as always. I love Otis. Every single time, in every single book. They all are sweet in their own way. This one shows how even seemingly grumpy people may be lonely and need friends. A cute little story about a tractor named Otis who just wants to befriend the new scarecrow on the farm. The kids love Otis and Colin thought the quiet game was hilarious. Otis makes a new friend who is better at the quiet game than anyone else. Everyone is intrigued when the farmer installs a scarecrow in the corn field. But for all his friendly efforts, Otis is unable to coax the newcomer away from his usual scowl. This one didn't work as well. Of course the scarecrow didn't respond -- but then why not? Otis is an animate inanimate object and everything, right? And in the end they think they did this great thing when really they all stood out in the rain for nothing, so what's the actual message? Also, why does the bull have round bear Everyone is intrigued when the farmer installs a scarecrow in the corn field. But for all his friendly efforts, Otis is unable to coax the newcomer away from his usual scowl. My mind wondered and so did the kids. 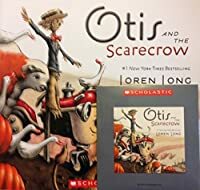 I'm always happy to see a book for young readers that teaches a valuable lesson, and Loren Long's "Otis and the Scarecrow" (Philomel Books, an imprint of Penguin Group (U.S.A), 40 pages, written and illustrated by Long, $17.99) accomplishes this goal with aplomb. It's big, square format book that's perfect for solo readers ages 3 to 5 and for adults reading aloud. It's the sixth entry in Long's Otis the friendly farm tractor series. Growing up on a Michigan farm, I never thought of our three tractors as particularly friendly, but Long transforms these mechanical workhorses into a lovable creature called Otis. "On the farm where Otis the tractor lives, the farmer has introduced someone new — a scarecrow to shoo away the pesky crows. But when Otis and the animals greet the scarecrow with friendly smiles, the scarecrow’s frown never leaves his face. So everyone leaves him alone. "Then one day, when a cold autumn rain sets in, Otis and the animals snuggle close and play Otis’s favorite game: the quiet game. Otis knows the puppy and ducks can’t sit still for long, and soon the farm friends begin to giggle and squirm, feeling warmed by one another’s friendship . . . but on this day, Otis can't seem to take his eyes off the lonely figure in the cornfield. "A deeply resonant book about subtle acts of compassion and standing up for others, featuring everyone's favorite tractor, Otis." A story featuring a big-hearted, compassionate tractor like Otis is a good a way of teaching young children about the values that humans so often don't practice. In an age where bullying -- particularly via electronic devices and "social" websites -- has become all too common by even very young children, the lesson that Otis teaches the other farm creatures -- and by, extension, readers of this book is particularly valuable. Loren Long (born 1964 in Joplin, MO) has putt puff puttedy chuffed his way all over the bestseller lists with such titles as Otis, Otis and the Tornado, Otis and the Puppy ,Drummer Boy, The Little Engine That Could by Watty Piper, Toy Boat by Randall de Sève, Mr. Peabody’s Apples by Madonna, and Of Thee I Sing by President Barack Obama. A graduate of the University of Kentucky (BA graphic design) Loren lives in a suburb of Cincinnati with his wife and two sons, all frequent visitors to his studio, where they see the art and hear the stories first. Synopsis: "On the farm where Otis the tractor lives, the farmer has introduced someone new—a scarecrow to shoo away the pesky crows. But when Otis and the animals greet the scarecrow with friendly smiles, the scarecrow’s frown never leaves his face. So everyone leaves him alone. Then one day, when a cold autumn rain sets in, Otis and the animals snuggle close and play Otis’s favorite game: the quiet game. Otis knows the puppy and ducks can’t sit still for long, and soon the farm friends begin to Synopsis: "On the farm where Otis the tractor lives, the farmer has introduced someone new—a scarecrow to shoo away the pesky crows. But when Otis and the animals greet the scarecrow with friendly smiles, the scarecrow’s frown never leaves his face. So everyone leaves him alone. A deeply resonant book about subtle acts of compassion and standing up for others, featuring everyone's favorite tractor, Otis." Plot: When a new Scarecrow comes to the farm, Otis and his friends want to befriend him; however, he is seemingly grumpy and silent. As the year goes on, nothing changes although Otis always wonders about the Scarecrow and how he feels. When it begins to rain one day, Otis cant help but rush to the Scarecrow's side and sit with him in the rain. Once his friends see him, they follow him and soon all of the farm animals are huddled around the Scarecrow to keep him from feeling lonely. Point-of-View: The story is told in third-person. Style: There is no particular style to this picture book. At one point the words were arranged horizontally as they followed Otis down the hill. I have been a fan of the Otis books since the very first picture book in this series came out. Who wouldn't fall in love with a tender hearted old fashioned red tractor that makes the best of friends with everyone on his farm? Fall has set in, the leaves are changing, the pumpkins are ready to harvest and there is a chill in the air. Along comes a new addition to the hill, a scarecrow! At first everyone is scared of this sour faced, stern statue who stands watch each and every day alone. But soon I have been a fan of the Otis books since the very first picture book in this series came out. Who wouldn't fall in love with a tender hearted old fashioned red tractor that makes the best of friends with everyone on his farm? Fall has set in, the leaves are changing, the pumpkins are ready to harvest and there is a chill in the air. Along comes a new addition to the hill, a scarecrow! At first everyone is scared of this sour faced, stern statue who stands watch each and every day alone. But soon, the crows pick at him and all turn away to ignore him. Otis, friendly as he is, can not understand why Mr. Scarecrow is so serious! There are no smiles, no greetings, no hellos. Can anyone befriend him? Fall story about Otis the tractor and his farm friends. A scarecrow is added to their fields in the summer. He just looks out at the world with a sour expression and doesn't talk to anyone. So everyone ends up leaving him alone. One cold fall day, it began to rain. Otis and his friends first took cover under the apple tree. Then when Otis sees the scarecrow all cold, wet, and alone, Otis sits down next to him in the field. All his friends gather around the scarecrow as well. Otis isn't sure, but Fall story about Otis the tractor and his farm friends. A scarecrow is added to their fields in the summer. He just looks out at the world with a sour expression and doesn't talk to anyone. So everyone ends up leaving him alone. One cold fall day, it began to rain. Otis and his friends first took cover under the apple tree. Then when Otis sees the scarecrow all cold, wet, and alone, Otis sits down next to him in the field. All his friends gather around the scarecrow as well. Otis isn't sure, but thinks he sees a trace of a smile on the scarecrow's face. This story would make much more sense if the main character wasn't a living inanimate object. If a tractor can go about on its own and talk and play with friends, why can't a scarecrow? I was a little disappointed with this entry in this series. Otis has had many great stories that have completely put the "awwwwww" factor in most of them. In this one we find that the farmer has put up a new scarecrow. He is out in the field alone and he seems to prefer it that way. Otis is always trying to be a most hospitable host and make friends. This scarecrow won't budge. He looks rather sour and a little bit scary. He still pursues friendship anyway. This is the heart of all the Otis stori I was a little disappointed with this entry in this series. Otis has had many great stories that have completely put the "awwwwww" factor in most of them. In this one we find that the farmer has put up a new scarecrow. He is out in the field alone and he seems to prefer it that way. Otis is always trying to be a most hospitable host and make friends. This scarecrow won't budge. He looks rather sour and a little bit scary. He still pursues friendship anyway. In this installment of Long's Otis the Tractor books, Otis and the other barnyard animals try to make friends with the newly arrived scarecrow. The scarecrow, however, is not very friendly. He never smiles and does not seem to appreciate the kindness shown by the others. During a sudden storm Otis decides to go keep the scarecrow company. The scarecrow doesn't acknowledge Otis or the other animals when they join Otis. But Otis is sure that the scarecrow displayed a hint of a smile during their vi In this installment of Long's Otis the Tractor books, Otis and the other barnyard animals try to make friends with the newly arrived scarecrow. The scarecrow, however, is not very friendly. He never smiles and does not seem to appreciate the kindness shown by the others. During a sudden storm Otis decides to go keep the scarecrow company. The scarecrow doesn't acknowledge Otis or the other animals when they join Otis. But Otis is sure that the scarecrow displayed a hint of a smile during their visit. "The scarecrow didn't look so lonely anymore, surrounded by friends." Though Otis and the animals on the farm try to make friends with the scarecrow, "He just stood there, that sour look on his face, staring at the cornfield." Summer turns into fall with its new activities on the farm and still the scarecrow is stoic. But sometimes being a friend means just "being there" for someone. Otis feels for the scarecrow and leads the farm animals in a show of support for their quiet companion. "As Otis w "The scarecrow didn't look so lonely anymore, surrounded by friends." Though Otis and the animals on the farm try to make friends with the scarecrow, "He just stood there, that sour look on his face, staring at the cornfield." Summer turns into fall with its new activities on the farm and still the scarecrow is stoic. But sometimes being a friend means just "being there" for someone. Otis feels for the scarecrow and leads the farm animals in a show of support for their quiet companion. "As Otis watched, he couldn't be sure, but he thought he might have seen the scarecrow smile." Otis is back in another sweet story about friendship. Here, Otis and his friends try to befriend the sour-looking scarecrow that the farmer puts up in the field. I love how all the characters in previous Otis books are back, and the illustrations are sweet and wonderful. The ending of the book is left up in the air -- we don't really know if the scarecrow likes the attempt at friendship by Otis and friends -- so readers have to be willing to speculate and be satisfied with the idea that it is al Otis is back in another sweet story about friendship. Here, Otis and his friends try to befriend the sour-looking scarecrow that the farmer puts up in the field. I love how all the characters in previous Otis books are back, and the illustrations are sweet and wonderful. I grew up in Lexington, Kentucky in the 1970’s. We had no artists of any kind in the family. We didn’t know any artists. I liked sports, especially baseball. My mother read to me a lot. But I have to admit, my favorite subject in school was gym class. I also liked to draw. My parents encouraged me to keep drawing.